Here's the scene: August afternoon, we're hungry, we're hot, we're tired. I open the fridge and pull out a plate of chilled Jasmine Tea Poached Shrimp Summer Rolls with a tangy plum sauce. The rice wrapper is light and the rosy shrimp show through, along with fresh carrot strips, avocado and tea infused noodles. It's too appealing to dismiss, but a little different (aka: not a sandwich), so my teenage son pauses to reconsider. My husband sits down right away (always my willing taste-tester.) The scene ends with a completely empty plate, slightly blotched with plum drippings from the less-than-elegant grab-fest that ensued. 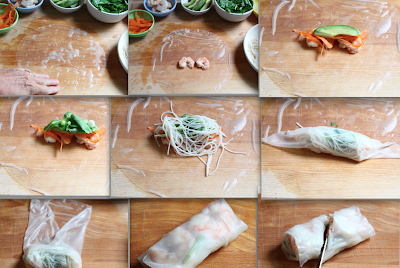 There is so much to love about summer rolls. I avoided making these for awhile, thinking the process would take so much time. It really doesn't take very long at all. 1) Quick (approx. 20 seconds) dunk in shallow warm water - add a little swirl. 2) Layer on your dry ingredients and roll it up. Cooking with tea is precise if you really want it to taste right, and temperature is one of the most important factors. Boiling tea will result in a bitter bite, so take care with using it as a poaching technique to not boil, but keep it just below that point. It results in a fragrant and tasty infusion, especially with shrimp. I made these Shrimp Summer Rolls in the evening, covered them with a slightly dampened paper towel and loosely wrapped the plate with plastic wrap. They are at their absolute best served just after a small chill, but were still excellent from a short overnight stay, too. Keeping them moist, but not wet, is important so the wrapper doesn't become dry or gummy. These were created for this month's Let's Lunch bunch (my global group of food friends that post each month and share a virtual lunch together.) This month's lunch theme was "Cold Entree". Also, for the next few days you can be assured of seeing many unique and globally inspired lunch ideas from our blogging-band-of-lunch-buddies. 2) In a bowl, add the Rice Noodles, 1 cup of the brewed tea and enough boiling water to cover the noodles plus a few inches for them to swirl around in. Cover and allow them to steep/cook in the liquid for 5 minutes. Drain and keep the noodles in the bowl, adding the Rice Vinegar and toss throughly. These can be held in the Rice Vinegar while prepping the other ingredients (or chilled overnight.) ** Drain off the Rice Vinegar JUST BEFORE using the noodles. 3) Prep the other ingredients and have everything out for layering on the wrappers before starting the wrappers. TO ASSEMBLE THE WRAPPERS: 1) In a large plate, pour in about 1/4 inch very warm water. Take out one wrapper and lay it in the water, flip it over getting both sides wet. Swirl it around in the water for about 20 seconds. You just want the wrapper to become pliable and soft without getting it too weak. 2) Drizzle the surface of your work board with a little water and smooth it around. Then lift the wrapper to your board and use your hand to swirl on the top of the wrapper to even out the moisture. 3) Begin your layering (about 2/3rds down the wrapper) with two pieces of the sliced shrimp. After that, it's really up to you ( I added the carrots, the avocado, a couple pieces of arugula, a few slices of the spring onion and ended with a finger full of the noodles.) Don't pile on too much of any one thing. 4) Pick up the bottom of the wrapper and fold it up and over all the ingredients and gently pull it a little tight just to squeeze the ingredients together well. Then, fold the sides toward the center and over your first fold. Then, holding your little bundle - roll it up the rest of the wrapper to the top. 5) Congratulate yourself, then either place that roll to the side for later or slice it in half (diagonally for a nice presentation) and place it on your serving platter or bowl. **If you need to hold these for later or the next day, be sure to cover them with a paper towel that has been wet and then squeezed out damp. Loosely cover the whole plate with plastic wrap and chill in the refrigerator. How very beautiful! And I love the idea of poaching the shrimp in tea. Mmm! gorgeous summer rolls! i haven't made them in forever; did something CRAZY with my leftover reice paper wrappers - made a gluten-free lasagna. it wasn't too bad, actually! What a delicious take on spring rolls! Wow, love your shrimp rolls, gorgeous. Great tip about making tea, not boiling water!